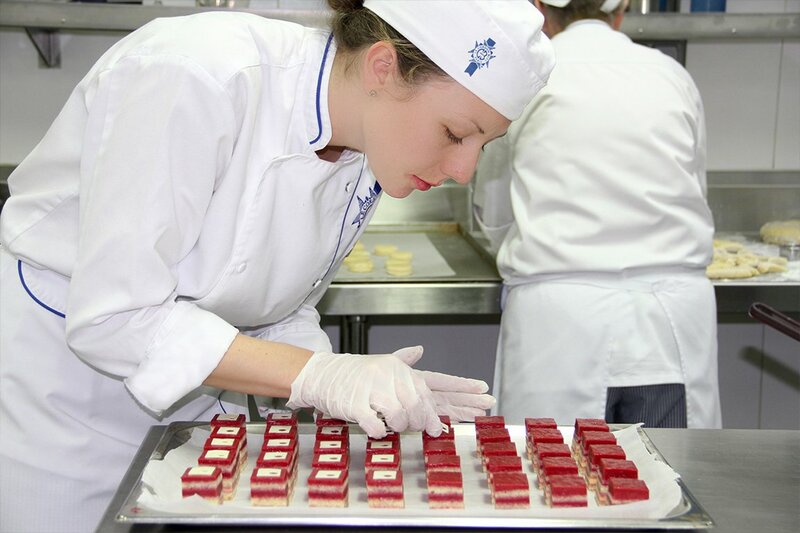 At Le Cordon Bleu New Zealand, high tea is a delicious performance art. The training restaurant is a serene oasis of white linen and polished tableware. Backstage in the kitchen there’s a feeling of suppressed excitement as the Diplôme de Patisserie students watch the first guests arrive. Coached by their Chef Lecturer they have spent the last day creating a selection of nine intricate mini gâteaux, petit fours and savouries. Made from the finest ingredients available these bite sized delicacies glimmer like jewels. “Every menu item requires patience and a delicate touch to make,” said Technical Director and Head Chef de Pâtisserie, Sébastien Lambert. As the order tickets flow in, the Chef pops the order onto the rail, and draws a line across the applicable table on the seating plan. “Table two, tea for four. Table 9, tea for two.” The students spring into action. The hot canapés are quickly cooked to perfection and plated by one team while another arranges the sweets on an elegant three-tier cake stand. The completed order is presented to the Chef for approval. When he gives the ok, a trio of students picks up the order. Flowing out of the kitchen in an orderly procession they wend their way to table two. One carries the cake stand. The second brings the plate of savouries and the third a plate with a trio of condiments. 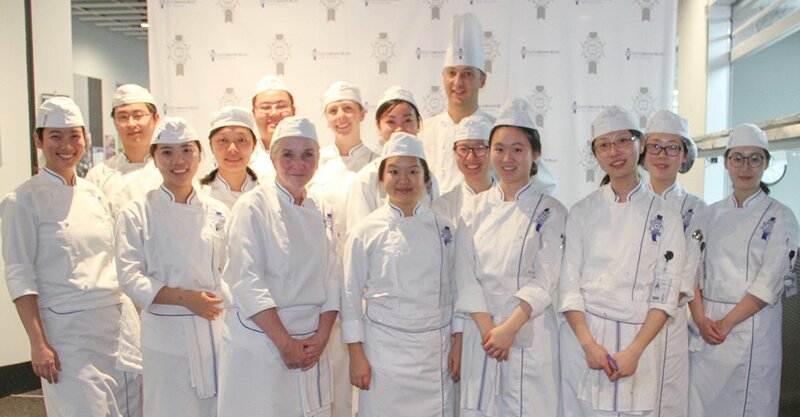 Smiling shyly in return, the students explain what each delectable morsel is and finish with a cheery bon appetit. The plates come back empty. Throughout the day, the “too beautiful to eat” comment becomes a familiar refrain. The mutual appreciation of delicious beauty creates a bond between the students and their delighted guests. So how does it feel to create edible art? The Opéra is an eight-layer showstopper. The traditional version is a rich fusion of dark chocolate and mocha. This updated version featured delicate layers of almond jaconde sponge infused with raspberry syrup alternating with melt in the mouth lemon curd and raspberry crémeux. It was topped off with a delicate arc of 1mm thin tempered dark chocolate decorated with a touch of bling – edible gold leaf. Their dessert was a modern interpretation of the classic Religieuse. Made from two crisp chocolate choux cases filled with chocolate diplomat cream this dessert contained a surprise inside. A sliver of fresh pear poached in Poire William liquor. Stacked on top of each other the choux resemble a nun – hence the name Religieuse. The choux were decorated with a whimsical wafer thin ruffled chocolate collar and pear Chantilly cream. Each delicious morsel on the High Tea menu brings the 14 students in the kitchen a step closer to becoming qualified French Patisserie Chefs. 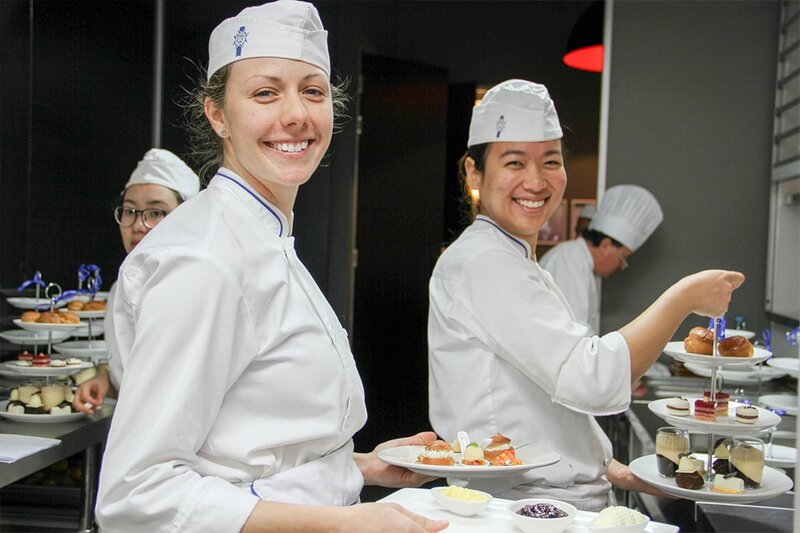 Want to experience High Tea at Le Cordon Bleu New Zealand? 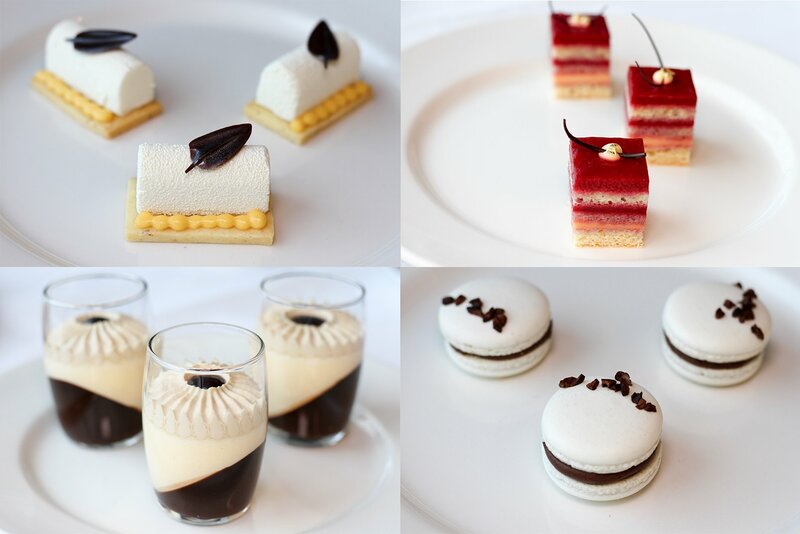 Photographs provided by Jessica He, Diplome de Patisserie student.